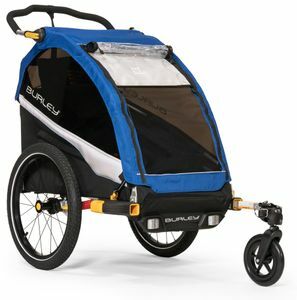 If you are looking for a bicycle trailer for your child that meets the highest demands in terms of comfort and functionality, you should choose the Burley D'Lite kids bike trailer. Only a few months ago, the Burley D? lite was completely overhauled by the manufacturer and upgraded with some new and improved details. 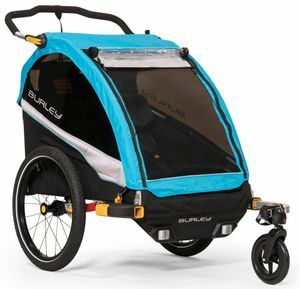 The Burley D'lite is the ideal bicycle trailer for one or two children. It can be loaded with a weight of up to 45 kilograms and has an interior height of 66 centimeters. The backrest of the seat is adjustable and has a practical cut-out for the helmet. The seat can be removed from the trailer in just a few simple steps so that additional space can be gained for transport without a child. The trailer has a sliding roll bar, which is height-adjustable and protects the occupants in case of tipping over. The child is secured inside the trailer with a safety belt that has a removable padding. Various reflectors and LED lights are mounted on the trolley, which enable high visibility when driving in the dark. The drawbar has a forged standard coupling and also has a safety flag. The spoke wheels have a size of 20 inches and can be removed with a push-button wheel attachment. This is particularly useful for transport in the car. The dimensions of the trailer are 86 by 79 by 96.5 centimetres when assembled and 95 by 72 by 32 centimetres when folded. The trailer weighs 12 kilograms. The frame of the trailer is essentially made of aluminium, the hood is made of polyester. Burleys innovations include adjustable suspension for more seating comfort, more user-friendly frame control and a redesigned parking brake. Some improvements have also been made to the soft top. 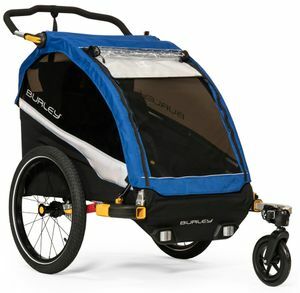 This is now height-adjustable and retractable and has been fitted with new waterproof zippers. The entire canopy is also waterproof and has UV protection, which also applies to the large windows. The Burley D? lite pendant is available in orange, yellow, red, green and blue. In the production of the trailer, attention was paid to the highest quality materials and careful workmanship, so that customers of this product will enjoy the trailer for a long time to come.